Quoted from Pasificpos, Mayor of Jayapura DR. Benhur Tomi Mano, MM, inaugurated Pasar Mama-Mama Papua, Jayapura City, Wednesday (7/03/2018) morning. The inauguration of the market, located in front of Aston Jayapura Hotel, coincides with the 108th Anniversary (HUT) of Jayapura City. Mama Mama Market Development in Jayapura, Papua, has been completed. The development that has been done since April 30, 2016 is ready to be used, from the building to other supporting facilities. "I am the Mayor of Jayapura to thank the President of Indonesia, Joko Widodo who has received the aspirations of Mama-Mama Papua to build a modern market in order to improve the economy-based economy sector in this city and also to state-owned enterprises, BUMD, Papua Provincial Government, Central, and Ulayat Rights Owners participating in the development of this market. " said the Mayor of BTM at the time to give a speech at the inauguration ceremony of mama-mama Papua market in printing street of Jayapura City. BTM said It is undeniable that Jayapura City as a service and trading city in Tanah Papua, need support by economic power based on populist. In the Special Autonomy Law, Article 42 Paragraph 1, states that community-based economic development, implemented by giving wide opportunities to indigenous peoples or local communities. 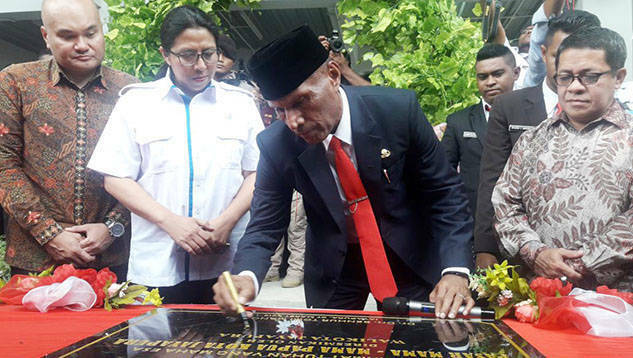 "For that Vision and Mission of Jayapura City Government in the next five years, my second term as my Mayor puts People Economic Empowerment to be one of the priority programs," he said. With this program is said to spur the growth of economic development in an area that aims to create an independent community of Jayapura City based on local wisdom, reduce the level of poverty, create jobs, and the creation of a tough entrepreneur. To achieve these objectives, it is expected to be able to implement the strategic policies seriously and directly to accommodate the economic interests of the sustainable society, the handling of the economy increasingly needs the right solution to raise the level and standard of living for the better. "Therefore, on this occasion I need to emphasize that this task is our common obligation both Government, Private and society itself." he said. BTM added With the inauguration of the market use of these Papuan Mama, it must be understood that the Central Government and Local Government Always have policies based on the interests of the general public. "For that market traders must be able to keep this market building, with a clean and healthy behavior and look professional, in this market, it will certainly give a good impression for the visitors and consumers, so that later consumers will come to shop a lot this, and also has an impact on increasing the economy of the traders of the market mama itself. " he said. Related reports from the Head Office of Disperindagkop City Jayapura about there are some places that have not been built, arranged it will be the attention of Jayapura City Government. "My message to all merchants not to damage assets in places that have been built, this place should be used in accordance with its designation." he pleaded. He also reiterated that in the market, not used as a gambling place, or alcohol. "Stop with gambling and togel activities in this market, stop with alcohol and others that only damage the image of the people of Papua, especially in the city of Jayapura," he said. He invited all market traders mama-mama Papua, in order to help the Government of Jayapura. "I ask that we can realize this place, this city in accordance with the development motto of Jayapura City and also the vision of jayapura city that is faithful, independent, prosperous, based on local wisdom." He also requested that has been inaugurated this market, then there are no mama-mama papua who sell again in front of the store, as well as mama noken seller.